Calendar View options - Desktop – Welcome to the NextMinute support and feedback centre. 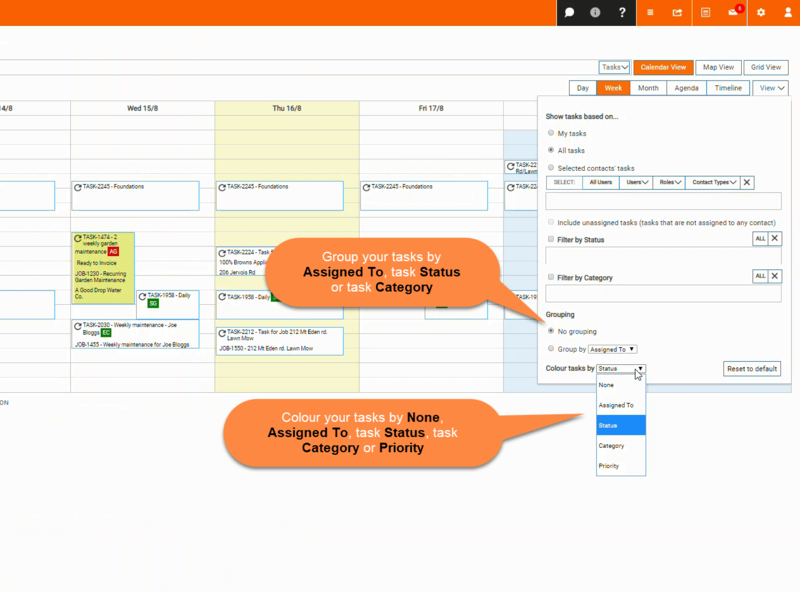 Within NextMinute you can organise your calendar to suit the way you work. View your tasks and employees tasks by day, week, month, agenda view or timeline view. Select whose tasks you want to view. Filter your tasks by task Status or Category (you can set these up in Lookup lists via your setup checklist). Group your tasks by who they are assigned to, their Status or category. 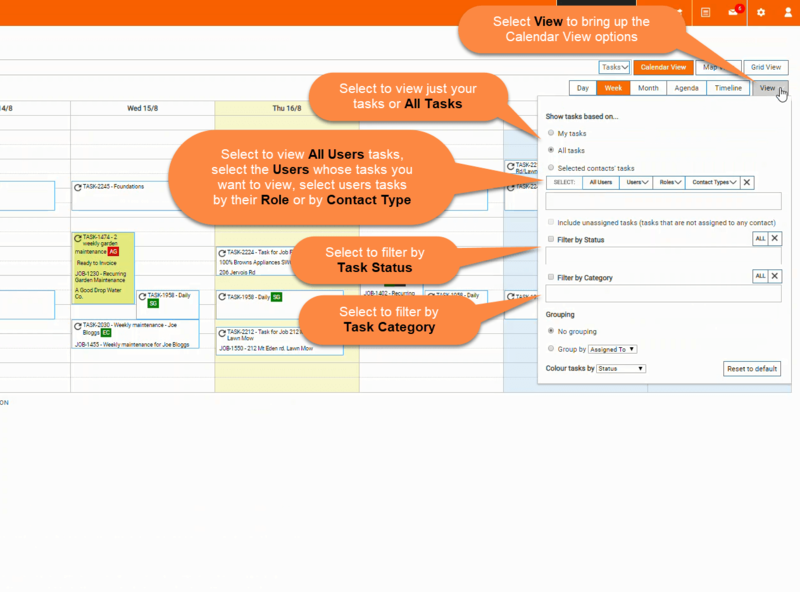 Colour your tasks by who they are assigned to, their status, category, priority or select none. Hover over your tasks to quickly view the Task details at a glance (View: Week, All tasks, no Filters, No grouping, Coloured tasks by Status). Choose to view only your tasks, All tasks or selected contacts' tasks. You can select to view All Users tasks, select an individual or a selection of Users tasks, view tasks by the users Role or view Contact Types tasks. Contact Types can be customised via Lookup lists in your setup checklist and then assigned to your contacts. You can assign tasks to contacts who aren't Users and view your calendar by Contact Types, these may be Contractors, Expert Plumbers, Builders, etc. Tick the box to include unassigned tasks. You may want to view tasks based on the its Status. This will allow you to quickly view which tasks have been completed, need to be done, are ready to bill and so on. Task Status' can be customised via Lookup lists in your setup checklist. You may want to view tasks by its Category. Task Categories can be customised to suit your business via Lookup lists in your setup checklist and then assigned to tasks. These help create order to your business and tasks. For example if your company is building multiple houses you may want to filter your tasks by the category Foundation, you will then see all tasks with that category. Choose to group tasks by who they have been Assigned To, the tasks Status or the tasks Category. Choose to colour your tasks by who they have been Assigned To, the tasks Status, Category or Priority. Here we have chosen the Week view and All tasks including unassigned tasks, no filters, Grouped by Assigned to and coloured by Status. You can then scroll through your calendar and see who is doing what, find any gaps through the week that you can fill with new Tasks and the tasks progress by its assigned status.